Summer is a beautiful season. There are lots of benefits of summer like extra vitamin D for your body, more chances to sweat, spend more time outdoors. It is also a great time to spend with children during their summer holidays. Though summer is a good season for many things, there are some adverse effects of this season too. Let's see what is to be done during summer season. •Drink a plenty of water, carry water bottle everywhere you go. Do not drink water from outside. Make sure it's a mineral water. Avoid ice, juices, anything liquid from outside as these can easily catch infection. •Cover yourself with soft cloths. Do not wear harsh clothes. Use soft cotton; cover your head with a long soft cloth or a scarf to protect your hair when you go out. You can also wear loose fitting clothes. •Use a good sun screen. 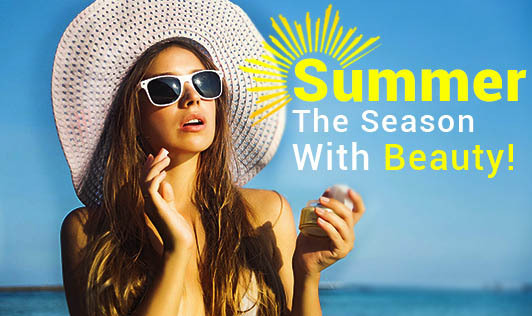 Use SPF 30+ which will protect your skin from ultra violet rays. Re-apply if necessary. •Wear an appropriate shoe when you are walking. It should not be too tight or too loose. Wear a perfect one, which has enough space which will allow air to enter, and does not cause infection due to heat. •Don't forget to use sun glasses to protect your eyes. Sun glasses also might protect your eyes from dark circles. •Maintain your energy level by concentrating more on fruits and vegetable than sugars and fat. •Instead of fruit juice opt for whole fruits/buttermilk/tender coconut water. •Go for a body massage, foot reflexology, and steam bath to relax you from hot sun.